U.N. Ambassador Nikki Haley is leaving the administration at the end of the year, she and President Donald Trump announced Tuesday. She gave no reason for her departure after two years, though there is speculation she will return to government or politics at some point. “No, I’m not running in 2020” for president, she joked. She said she would be supporting Trump. 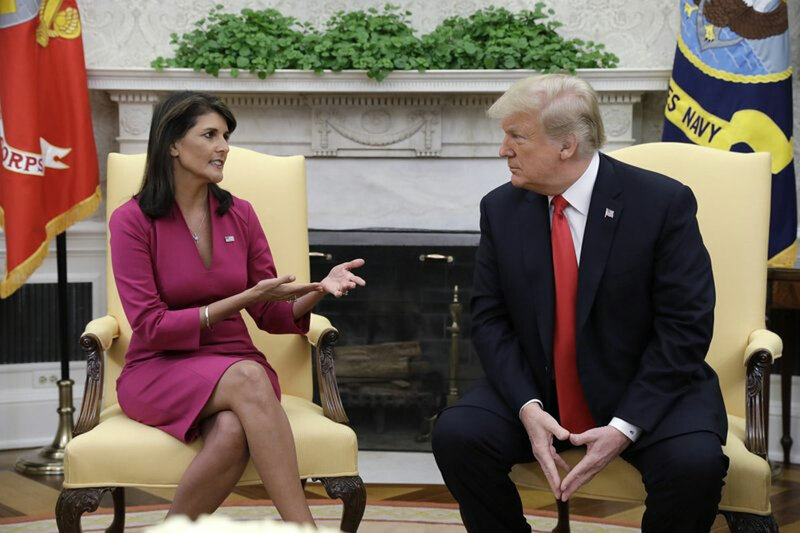 Haley said she and Trump together had “solved a lot of problems. They spoke in the Oval Office, shortly after word came of her plans to resign. Trump called Haley a “very special” person, adding that she told him six months ago that she might want to take some time off. As governor, she developed a national reputation as a racial conciliator who led the charge to bring down the Confederate flag at the Statehouse and helped guide the state through one of its darkest moments, the massacre at a black church.